In an electric mixer, blend all of the ingredients on medium for 8 minutes until frosting is smooth. Divide the frosting into separate bowls and add your desired food coloring. Fit a piping bag with a round tip and fill the bags with frosting to decorate. Outline the cookie first, let it dry, and then fill in the middle. Then let the frosting harden before packaging up your cookies. There are so many adorable things you can buy for Mom, but pairing them with something you made is always going to melt her heart! I made some easy “MOM” sugar cookies with a yummy sugar cookie icing. They’re simple to make and even more fun to decorate. Get out your dough and "M" and "O" shaped cookie cutters. I rolled the dough out on my Silpat that was placed on the cookie sheet. Then I baked the dough before cutting shapes into it. I did this because the cookies always expand after baking and I thought this would be an easy way for them to keep their true shape. They also cut very easily when the dough is warm. It worked out wonderfully! Preheat the oven to 350 degrees and bake the dough for 10 minutes. Remove from the oven and press cookie cutters into the warm dough. Once you’ve cut all of the cookie shapes, remove the excess dough around the edges. You can use a knife if you need to cut the shapes a little more. Then you can eat the extra cookie scraps! Let the cookies cool completely before removing them from the cookie sheet. Follow this icing recipe and divide it into two frosting bags with fitted round tips. Outline the cookies with the frosting first. Let it dry and then fill the rest using the same piping tool. The frosting will dry in about an hour and then you can package them up. To package the cookies, use cellophane baking bags and cut a piece of decorative paper to place inside. 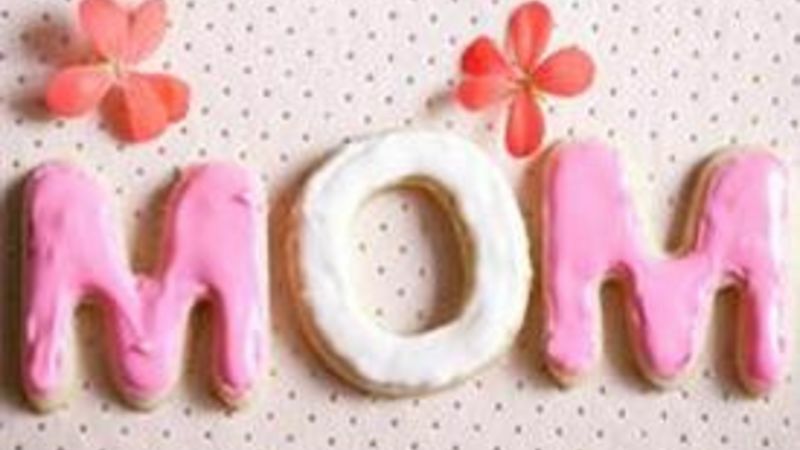 Then stack the cookies on top of each other to spell “MOM.” Tape the back closed and tie a ribbon! I am so excited for Mother’s Day this year because I’m going to be a first time mom and I can officially celebrate the holiday! ;) Happy Mother’s Day!